"When it was a Game" Parts 1-3. HBO. To me, the best baseball show ever made! Gorgeous, historic color footage with wonderful narration. 3-disc set. 1960 World Series Game 7, New York Yankees vs Pittsburgh Pirates, Bill Mazaroski's historic home run. A commercial DVD with the TV & Radio audio. Compilation Disc: 1962 World Series Yankees vs Giants (22 minutes) -1963 World Series Yankees vs Dodgers (37 minutes) -1964 World Series Yankees vs Cardinals (39 minutes). Official MLB Highlight films on one DVD. Sparkling color! 1963 World Series: Los Angeles Dodgers vs New York Yankees, Games 1-4; Radio audio; mp3 audio files burned to a CD. Joe Garagiola & Ernie Harwell. Decent sound quality....a few imperfections. Game 3 plays a little slow. 1968 Boston Red Sox vs Detroit Tigers compilation DVD. COLOR videotape clips of the April 10...June 18...August 9...August 10...& August 17, 1968 games. About 40 minutes total. 1968-69 Boston Red Sox compilation DVD: vs Orioles, Indian, Angels & Pilots. COLOR videotape clips ranging from 3 mins to 10 mins About 53 minutes total. 1969 Red Sox compilation. COLOR videotape clips vs Twins, Orioles, Indians, & Yankees. Highlights of Tony Conigliaro & George 'Boomer' Scott. Approx 53 minutes. 1969 June 15, Oakland Athletics at Boston Red Sox. A partial game. COLOR videotape. Run time about 2 hours 5 minutes on 2 discs. A's wearing their grey sleeveless vests! 1969 June 21, New York Yankees vs Boston Red Sox. A partial game. COLOR videotape. Run time about 45 minutes. 1969 July 10, Baltimore Orioles vs Boston Red Sox. A partial game. COLOR videotape. Run time about 1 hour 6 minutes. 1969 Word Series: New York Mets vs Baltimore Orioles Game 2, An outstanding CBC black & white picture with commercials. The complete 5-game 1969 World Series On DVD! 1969 Word Series: New York Mets vs Baltimore Orioles Game 3, Excellent color picture! The complete 5-game 1969 World Series On DVD! 1969 Word Series: New York Mets vs Baltimore Orioles Game 4, Excellent color picture! The complete 5-game 1969 World Series On DVD! 1969 Word Series: New York Mets vs Baltimore Orioles Game 5, Excellent color picture! The complete 5-game 1969 World Series On DVD! 1970 Baltimore Orioles edited COLOR videotape highlights. Compilation disc: May 23 vs Red Sox, 3 min...May 24, vs Red Sox, 5 mins...August 4 vs Red Sox 18 min...August 9 vs Yankees 1 minute. 1970 Boston Red Sox edited COLOR videotape highlights. Compilation disc: April 7 vs Yankees, 10 mins... April 10 vs Senators, 3 1/2 mins...April 11 vs Senators, 10 mins...May 19 vs Tigers, 5 mins...May 22 vs Oriole,s 7 mins (silent)...and, May 26 vs Senators, 14 mins. 1970 Boston Red Sox edited COLOR videotape highlights. Compilation disc: April 24, Game 1 of a doubleheader vs Brewers, 9 min...May 9 vs A's, 7 mins...June 21 vs Yankees, 7 mins...July 26 vs Brewers, 3 mins...August 15 vs Twins, 8 mins...August 16 vs Twins, 7 mins...August 21 vs Royals, 5 mins...August 23 vs Royals 15 mins. 1970 Boston Red Sox edited COLOR videotape highlights. Compilation disc: May 24 vs Orioles, May 23 vs Orioles, May 30 vs White Sox, May 31 vs White Sox, June 7 vs Royals, June 9 vs White Sox...also includes CBS news stories on the 1970 Indianapolis 500, Bob Feller & The Belmont Stakes. Total run time on the disc 1 hr 2 min. 1970 Boston Red Sox edited COLOR videotape highlights. Compilation disc: June 20 vs Yankees, July 4th vs Indians, July 5 vs Indians, July 6 vs Tigers...CBS news stories on Chi Ching breaking world record hurdles & Wimbledon. Total runtime on the disc, 56 minutes. 1970 Boston Red Sox edited COLOR videotape highlights. Compilation disc: July 9 vs Tigers, July 4-5 vs Indians, July 6 vs Tigers, July 11 vs Indians, June 21 vs Tigers...and, CBS news stories on Miss Universe & NFL negotiations. 1 hour 2 minutes. 1970, September 2, Montreal vs Pittsburgh, A rebroadcast of the CBC telecast. Black & white with onscreen inning-by-inning scoreboard at the bottom of the screen. An excellent 3-disc version! On DVD! 1970 Word Series: Cincinnati Reds vs Baltimore Orioles Game 1, A very good quality black & white CBC broadcast with commercials. 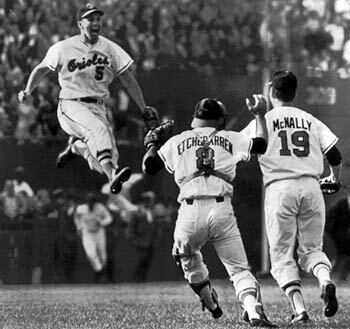 Highlights include the controversial Elrod Hendricks empty-glove tag play at the plate and Brooks Robinson's sparkling play. The complete 5-game 1970 World Series On DVD! 1970 Word Series: Cincinnati Reds vs Baltimore Orioles Game 2, Mid-Atlantic Sports Network (MASN) "Orioles Classic" re-broadcast of the CBC broadcast. Outstanding black & white picture. 3-hours. The complete 5-game 1970 World Series On DVD! 1970 Word Series: Cincinnati Reds vs Baltimore Orioles Game 3, Mid-Atlantic Sports Network (MASN) "Orioles Classic" re-broadcast of the CBC broadcast. Includes the classic image of Brooks Robinson on his belly, holding the ball afer snagging a line drive. Outstanding black & white picture. 3-hours. The complete 5-game 1970 World Series On DVD! 1970 Word Series: Cincinnati Reds vs Baltimore Orioles Game 4,Mid-Atlantic Sports Network (MASN) "Orioles Classic" re-broadcast of the CBC broadcast. Outstanding black & white picture. 3-hours. The complete 5-game 1970 World Series On DVD! 1970 Word Series: Cincinnati Reds vs Baltimore Orioles Game 5 Mid-Atlantic Sports Network (MASN) "Orioles Classic" re-broadcast of the CBC broadcast. Outstanding color picture. 3-hours. The complete 5-game 1970 World Series On DVD! 1971 Baltimore Orioles vs Boston Red Sox edited COLOR videotape highlights...approx 50 minutes of footage from a 3-game series May 21-23. 1971 Boston Red Sox edited COLOR videotape highlights. Compilation disc: May 29 vs A's, June 13 vs Royals, August 11 vs A's, August 21 vs A's. About 57 minutes total. OAKLAND A's Official World Series films from 1972, 1973, 1974 & 1989 all on ONE DVD. 1973 World Series: Oakland vs New York Mets Game 2, Assembled from NBC, Classic Sports, film & radio, the most complete version of this game possible. Nearly 4 hours! On 4 DVD discs. 1975 World Series Game 1: Cincinnati vs Boston, Luis Tiant baffles the Big Red Machine. Complete with commercials! Very Good! The complete 7-game 1975 World Series On DVD! 1975 World Series Game 2: Cincinnati vs Boston, the first hour... 3 innings and pregame a very watchable picture. I'd call it a "7". The picture improves to excellent as the 4th inning starts. Has commercials. Reds even the series! The complete 7-game 1975 World Series On DVD! 1975 World Series Game 3: Boston vs Cincinnati, Scene shifts to Cincinnati. The Reds take a 2-1 lead in ther series. Features the Ed Armbrister controversial bunt. Complete with commercials! Very Good! The complete 7-game 1975 World Series On DVD! 1975 World Series Game 4: Boston vs Cincinnati,Outstanding picture! No commercials. The complete 7-game 1975 World Series On DVD! 1975 World Series Game 5: Boston vs Cincinnati, Tony Perez homers twice! Very Good picture! Has commercials! The complete 7-game 1975 World Series On DVD! 1975 World Series Game 6: Cincinnati vs Boston, A game filled with turning points and drama...topped by Carlton Fisk's game winning home run. Over 4 hours. Red Sox would "win the series 3 game to 4". Complete with commercials! Very Good! The complete 7-game 1975 World Series On DVD! 1975 World Series Game 7: Cincinnati vs Boston: Reds score the winning run in the 9th inning. Complete with commercials! Very Good! The complete 7-game 1975 World Series On DVD! 1976 Kansas City vs Baltimore, "Monday Night Baseball", Reggie Jackson's only season in Baltimore. Picture's not too bad...a bit "soft", I guess it a 7+. Warner Wolf & Bob Gibson form the announcing team. On DVD! 1977 World Series: New York Yankees vs Los Angeles Dodgers Game , From MLB and A&E network. 1977 World Series: New York Yankees vs Los Angeles Dodgers Game 3, From MLB and A&E network. 1979 World Series Game 1, Baltimore vs Pittsburgh, Bruce Kison vs Cy Young Award winner, Mike Flanagan Sterling picture! From MLB and A&E network. 1979 World Series Game 2, Baltimore vs Pittsburgh, Bert Byleven vs Jim Palmer Run time 3 hours! Sterling picture! From MLB and A&E network. 1979 World Series Game 3, Baltimore vs Pittsburgh, Sterling picture! From MLB and A&E network. 1979 World Series Game 4, Baltimore vs Pittsburgh, Sterling picture! From MLB and A&E network. 1979 World Series Game 5, Baltimore vs Pittsburgh, Sterling picture!From MLB and A&E network. 1979 World Series Game 6, Baltimore vs Pittsburgh, Sterling picture! From MLB and A&E network. 1979 World Series Game 7, Baltimore vs Pittsburgh, Sterling picture! From MLB and A&E network. 1983 World Series: Baltimore vs Philadelphia Game 1, a bit over edited, goes from batter-to-batter...no in-between-inning commentary or footage. Run time about 1 hr 45 min. Picture is a bit grainy, some antenna shadowing. Video runs out in the bottom of the 9th.